swing over a carpet, originally uploaded by jahansell. It's hard to read that this is a swing - but it seems magical, doesn't it? very nice fall photo. I actually prefer this type of fall photo versus colorful leaves on a tree. What simply stunning photo, a beauty. Once again, you bring me the autumn that cannot be seen here. This is truly, as you said, a magical photo. 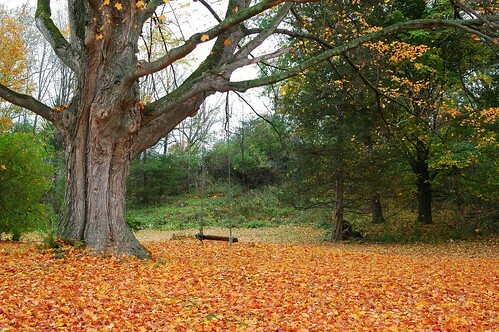 In addition to the visual, I couldn't help but notice that the "mature" wonderful tree is supporting the child's swing. But, then again, who's to say that a 94 year old grandmother might suddenly appear to swing on it?